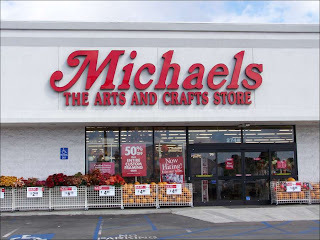 If you are all about DIY-ing ["Doing it yourself"] then there's probably a pretty good chance that you have stopped by a Michael's craft store once or twice. I'm pretty sure I keep my local store in business single-handedly- there is just so much stuff there that I covet! Even a walk through the store gets my creative juices flowing. **Cue the Frugal Friday segue. ** Are you a part of their e-mail newsletter club? If you are, then you know that you get a 50% off coupon immediately for joining and the weekly ad delivered to your email inbox as well as intermittant special offers and coupons. And if you aren't? Well... you are missing out! Click here to sign up and start saving on everything you need for your next event from cupcake liners to rubber stamps.